I have been watching Korean dramas and there is something I noticed. When someone is not feeling well, they will use a needle to prick the fingers. How does that help? Is it a Korean thing? Yes. To be more specific, it is a type of acupuncture. The remedy itself is really easy. Sanitize a needle either by burning the tip or washing it with alcohol. Tie your thumb with a string or a rubber band to constrict the bloodflow. Then prick the little sliver of flesh on the corner of the thumb where it meets the fingernail. Press and let the blood out. The end result should look like the picture below. 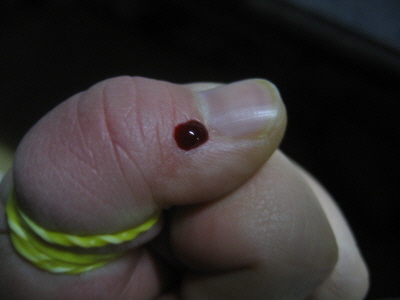 Example of a medicinally pricked finger. Based on personal experience and numerous, numerous first-person accounts, this remedy works like a charm; usually after about 15 minutes or so, you can feel the "stuck" feeling slowly going away. But how does this work? Chinese medicine practitioners have an explanation based on the body's qi flow and about how the bodily functions are replicated on a person's hand. But as far as the exact science is concerned, the mechanism by which pricking a finger helps indigestion is a mystery, like the way the exact mechanism by which acupuncture helps is still a mystery. Also, Korean doctors warn that this remedy only mitigates the symptoms without curing the underlying cause. Feel free to try out this remedy, but the safe thing to do is to visit the doctor. It also doesn't work for everyone. I seem immune to the benefits of finger pricking, although other forms of acupuncture do seem to work on me. I got sick in Korea when I came for a visit one summer because I ate some meat that hadn't been completely cooked and my immune system wasn't totally adjusted to Korea after having been out of Korea for more than 15 years. The next day I ate some juk (rice porridge) and kept complaining that my stomach was killing me. My aunt tried the finger pricking thing. I'd have to say that it worked to relieve my nausea, but definitely not in the way that she had intended, as I barfed all over her the instant the pin went in. And that my friends, is the first and last time I ever tried it. 1. Placebo effect - The belief that the method is effective actually helps alleviate the symptom. 2. The pain dissociation - Because of the fear/pain of getting your finger pricked, you forget about the original pain (the indigestion). My response: Psssh~~ As a Korean who has got her finger pricked after having an indigestion, I can testify that this stuff works! After you threw up did you get better? If you did, the finger pricking did work. Relief comes in different forms. Throwing up is the body's way on removing a foreign substance, so can't really say what gave him the relief. Burning or washing the needle isn't correct sterile procedure, and you're still risking an infection. I would suggest that history is full of pseudoscience remedies that have since been discarded as useless and dangerous. Acupuncture has no good evidence supporting its use, and has been associated with dangerous (and even fatal) infections. Scientist and doctors don't like to talk about it, lest they be labelled ethnocentrists for condemning an "Eastern" medicine. Funny, I thought Europeans just called it bloodletting. Here is an English lesson: the plural of anecdote is "anecdotes," not "data." I know of no study addressing this particular claimed benefit of acupuncture, but I do know that every well-controlled trial of acupuncture has failed to produce a measurable effect. which might have happened elsewhere, which would most certainly cause severe infections since those wounds from rusty saws would leave a open slit. Also, In a country like Cuba, there was a time when doctors and dentists did not have access to pain relievers, hence the whole country started to adopt acupuncture as a reliable means of pain relief to this day. "In the first half of the year, more than 2,000 people had teeth removed using acupuncture as anesthesia in Las Tunas, 694 kms east of Havana. The anesthetic method was also used with positive results in hospitals in that province." I also had a colleague in pre-med/dental who was from Cuba who told me about this firsthand. I would think twice before blindly discounting unfamiliar methods due to ignorance. Even I don't know much about eastern medicine, since there isn't much available information in English and time has a large factor in the loss of countless artifacts through war and other ravages. however I don't go around telling people that it's witchcraft. There are things that both western and eastern health providers don't know about the body. I felt a little better since some of the undigested meat came out of me, but I don't think my aunt appreciated it. I couldn't eat anything for the rest of the day until it was entirely out of my system. Grab your left arm with your right hand, palm facing the bend in your elbow and your thumb behind the elbow joint. Now, move your hand forward allowing your thumb to slide over your elbow joint. You'll feel a tingle in your left hand below your pinky and ring finger. I remember my dad doing this when I was a kid having a bad tummy ache. It works miraculously. I'm not Korean, but I think this method has been used in any Asian family. "Acupuncture has no good evidence supporting its use, and has been associated with dangerous (and even fatal) infections."
? When and where has acupuncture been associated with dangerous or fatal infections? I suppose if the practitioner fails to sterilize the needles, this could happen, but that's no different from any other kind of doctor doing his job poorly. Keep in mind that the lack of evidence for something doesn't constitute evidence against it. That's a fallacy. The National Institute of Health's studies were "inconclusive" and "hard to interpret," which doesn't give solid reasons for or against believing in acupuncture's efficacy. They are probably the most 'objective' and 'credible' source for research on this, but if anything they would be biased against alternative medicine rather than towards it. They weren't exactly happy to be doing these studies on such weird fringe medicine at all at the time, which happened mainly because of the influence of a single Senator. After going out for grilled meat with the hagwon boss last night I felt deadly sick enough to give this a try. I'm so scared of needles that I wasn't even able to draw blood - just make a slight dent in the skin. Within one minute I violently vomited up everything I'd eaten. So now I feel great and can go to work! Thank you Ask a Korean! THX ALOT!!! MY brother had a bad stomachache and i didnt know what to do! Then i found this page and i tried!! It works like a miracle! My brother vomited immediately and he felt much better!! Thanks Ask a Korean! I've always wondered why people in dramas scratch the needle on their heads before pricking someone's finger. Now, I'm very familiar with finger pricking, but that's always bothered me. Doing that is down right unsanitary. Why do some Koreans do it? I watched a Korean drama lately and was curious about the finger pricking too. And to think that it led me to this fantastic blog. I am elated ! Thanks loads. I'm assuming everyone is aware that neither first-hand experience nor any number of anecdotes is really evidence that this works, especially given that waiting 15 minutes is a pretty good cure for indigestion with or without a finger prick. Acupuncture doesn't work in the sense that it doesn't work any better than sham therapy (that is, poking people in random places or with realistic-feeling needles that don't penetrate the skin). I don't think many argue that it doesn't work at all. Eliot, you are correct that absence of evidence isn't generally the same thing as negative evidence. But scientific claims should be rejected by default, and at any rate a large number of studies failing to find positive evidence are what you'd expect from an ineffective treatment. This is particularly true for a treatment that does work, but not in the way it's supposed to ("stabbing people with needles makes them less nauseous, but it doesn't really matter where the needles go"). Theoretical arguments (no plausible mechanism apart from placebo; number of meridians is linked to number of rivers in China; general incompatibility of TCM worldview with scientific physicalism) should push a neutral observer further towards disbelief. As a side note, the almost absurd levels of publication bias that seem to plague the East Asian and especially the Chinese medical establishments aren't helping. Ok, I'm Greek and the first time I saw pritching your finger to cure indigestion was in a Korean drama some days ago, and accidentally found this page (I was not searching it). Well, I just wanted to say: Adam is so 100% right. something wicked this way comes"
This type of accupunture is technically bloodletting and is rooted in 100s of decades of anecdotal and professional evidence and although this has yet to be conclusively "proven"(a dirty word in "real" science) it doesn't mean it doesnt work for a majority of people. But just because a hypotheses has yet to be recognized as correct doesn't mean it wont ever be. Probiotics are a good example of something western medicine discounted for decades as bunk science and hippy dippy BS, now its a commonly accepted idea among practitioners all over. As we now I understand how gut Flora balance is a controlling factor with the body's immune system. Ever wonder why as a girl or woman getting an xray they always ask if you have a chance of being pregnant. Because although originally completely discounted, the data shows many child cancer cases correlate with prenatal Xray exposure which tooks decades to prove because no one wanted to take responsibility for children getting cancer. A number children react badly to their immune response, caused by too many immunizations in a short period of time causing them to get autism. But its also possible the # of cases being cited by this could also be off set substantially by the number of women having children after 35. Medical Science is a practice because our understanding is always growing and changing. The human body is a complex collection of Biomechanical and biochemical systems that make up a whole. Unfortunately Western medicine usually compartmentalizes these into their individual parts and symptoms rather than looking at the whole body holistically. Which is an incomplete view of things. When one part goes down, other part/systems will pick up the slack where they can to keep the body alive and kicking. And Qi or Chi could possibly be interpreted as the vast network of Bioelectric lines running throughout out our bodies(Nerves) and the Bioelectric field created by and around every cell allowing each system biochemical energy flowing along to check-in with the CPU(brain). So it can adjust based on nesscesity of the whole. Acupuncture, Acupressure & Reflexology all utilize the idea of the body's bioelectrical (nervous) system as a the connecting unit between the brain,the organs, and other systems. Which in a way is correct seeing as the nerves connect the rest of the body to the brain. And the flow of biochemical energy can be blocked and stimulated by injuries and therapies. It could be the the nerves precive these therapies as an attack on the system sending signals to bring in endorphins and blood flow to that area to Aid in healing and pain control. Pain is an error signal to our brains telling us attention is needed in an area or system. But in a busy world where we cant always make allowances to heal properly or reset our systems properly. Anything that helps people to have a truly better quality of life is good in my book. There is much safer way to do this than sterilising a needle. You can buy a tool designed for this task, it looks like a pen. You buy a box of sterile needles that fit the tool for once only use. The 'pen' is spring loaded on pressing the top, so the needle quickly juts out a few mm and on placing against the fingers delivers the correct depth. Allows you to do all fingers easily. In my experience I do not agree with the theory that the pain distracts you from the symptoms. It's not painful enough and you can't feel the pain after administering the needle. Placebo... Possibly. First hand experience I have used the method of pricking all fingers and thumbs on both sides at the top joint successful in rapidy shifting severe indigestion. On a similar topic I have also been shown a technique of massaging the areas described above. (Both sides of each digit on the top joint. Using any firm object such as a pen or your finger nails when you massage hard those areas you will feel and almost hear a gristley lump or node. If you are suffering symptoms supposedly massaging these points will affect different body areas. The more pain and gristley those nodes are the more they highlight a problem area and should be massaged. Cheers!